It looks like an ambulance on steroids, as it has the facilities to provide sophisticated, uninterrupted ICU care during a hospital-to-hospital transport. It is 18,000 pounds of green, rolling intensive care unit. The Critical Care Transport program at the University of Alabama at Birmingham welcomes its newest piece of lifesaving equipment, a Ford chassis/Taylormade body ground transport ambulance. It looks like an ambulance on steroids, as it has the facilities to provide sophisticated, uninterrupted ICU care during a hospital-to-hospital transport. Critical Care Transport is a UAB hospital-based, inter-facility transport program for patients in the United States and worldwide who require transport from one medical facility to another. CCT has been providing medical transports for more than 30 years and has transported more than 50,000 patients. The team employs a twin-engine Cessna Citation Bravo jet for long-distance transport and three ground units for local moves. The new unit arrives at an opportune time, as CCT has been increasingly busy over recent years. The program estimates it has flown or driven more than 42 million miles, to 46 states and 38 countries. 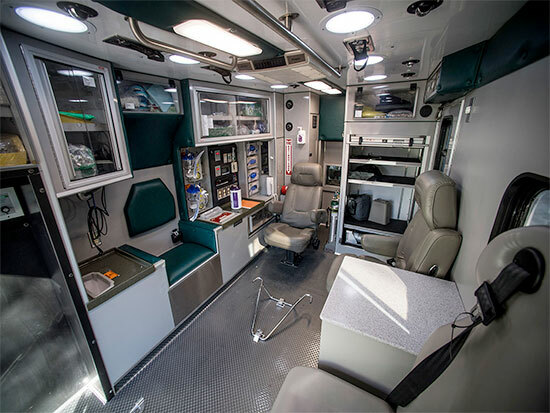 A look inside the new, rolling intensive care unit.“Before the acquisition of this unit, our last new ambulance came online five years ago, and that vehicle now has nearly 300,000 miles on it,” said Laura Lee Demmons, director of CCT. “The new ground unit will be a welcome addition to our operations, and will provide even better support for our patients.” In addition to its ability to serve as a mobile intensive care unit, the new ground unit offers a number of enhancements for patient and crew safety. Equipped with liquid suspension, which lowers the vehicle for easier loading and has a comfort setting that gives the patient a much smoother ride. Employs a mechanism that senses the grade of the road and diverts power to the appropriate wheels. Its mirrors automatically fold in upon parking and telescope in and out for better visibility. It has a diesel exhaust fluid gauge that tells the driver the level of exhaust fluid remaining. Loss of exhaust fluid causes the engine to slow down automatically to 50 mph. Previous vehicles did not have a fluid gauge. Traction control to keep the wheels from spinning. Engine braking that assists with wet or slippery roads, automatically slowing the engine to avoid extreme manual braking, a very valuable feature in a heavy vehicle. Features captain’s chair seating for the medical team, providing accessible workspace while safely seated. The cab has Bluetooth technology so the driver can communicate hands-free. More driver controls are located on the steering wheel, allowing the driver to keep hands on the wheel and eyes on the road. Critical Care Transport has been accredited by the Commission on Accreditation of Medical Transport Systems since 1999. CAMTS is a national and international peer review organization that promotes voluntary compliance with standards that serve its two highest priorities: quality air medical and ground patient care and safety of the transport environment. CAMTS accreditation is a mark of excellence recognized by federal, state and local government agencies, as well as private organizations and the general public.